восток рогалик корабль (vostok rogalik korabl' or east bagel ship) is a turn-based shoot-em-up made in 7 days for 7DRL 2018. Apologies for any bugs, this was very hard to make in under a week. Use cursor keys or W,A,S,D to move, Space to fire. 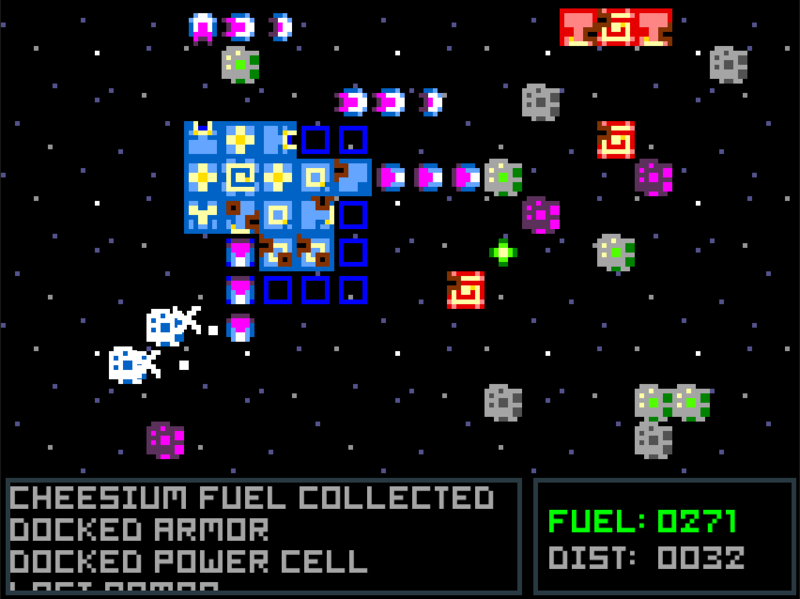 Firing activates any blocks attached to your ship: guns fire, repair units heal the ship, etc. Ram (ramming does not damage you) or shoot an enemy's core to destroy it (the 1st wave of enemies take one hit to kill). Collect its left-over blocks by moving into them. You can only dock with green blocks in your power grid (blue squares). Extend your power grid by docking power cells. You have limited fuel. Collect cheesium from green space rocks. If you can dock a Yendorium Reactor, this will not be a concern. I've done some more work on this idea as sandbox game: Star Shaped Bagel. An awesome turn-based space strategy. It took me a while to figure out which block does what and which should go where, but after that, the rest was easy, except for an occassional fight with a 10-block miniboss. I occasionally come across an invisible block that gets enemies stuck and stops bullets. It sometimes destroys my entire ship if i ram into it. Is this a bug, or is it like a black hole of some sort? It's a bug. I'm guessing I've messed up the ship spawning code and it mangles deploying it to the next chunk of map. I'd like to fix it, but I've had 6 new ideas for blocks (tractor beam, slaver drill, support fighters, etc. ), an idea for an open map with long range sensors, and some thoughts on a lunch break length campaign across hostile space. After I've updated my previous game release I'll be able to risk going near the code. I enjoyed how every move feels like it matters. Although the learning curve is steep and I didn't get very far, the game play is rich in its simplicity. I really liked the blending between space shooter and roguelike mechanics in this. The mechanics might be easier-learned if they were more spaced out, but that kind of stuff can be challenging for a jam submission. Using Chrome browser I had to enable "WebGL Draft Extensions" in chrome://flags/ to get the game to run.